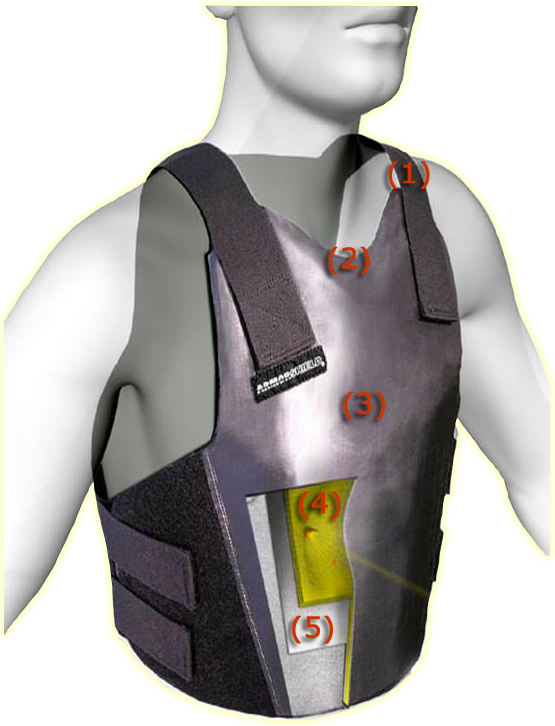 When a bullet is defeated by body armour a high level of energy is transmitted through the vest. The effect of this energy on the human body is known as blunt trauma. In many cases, blunt trauma can cause serious injury or even prove fatal. The permitted level of blunt trauma (Back Face Deformation) can be seen on the ballistic standards page. 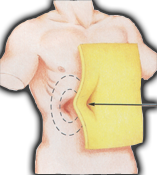 Armourshield Blunt Trauma System absorbs and distributes the bullets energy over a wide area of the body. Injury is minimised.  Without the trauma shield, energy is transmitted directly to the body. Injury can be extreme. With this in mind Armourshield developed and patented a Blunt Trauma Shield (BTSTM) which considerably reduces the effects of blunt trauma by absorbing energy and distributing forces over a much larger area. This system, introduced shortly after the company was established, was ultimately developed into the MultiflexTM BTS which provided a much greater degree of flexibility. This also permitted the area of the BTS to be enlarged to cover almost the entire area of the ballistic pack without compromising comfort and is particularly suited to covert vests. Armourshield vests are fitted with the MultiflexTM as standard but the original BTSTM may still be specified should operational requirements deem this to be necessary. Whichever system is used, the trauma shield is a permanent and integral part of the body armour manufactured by Armourshield; it is not an optional extra. When a hard armour upgrade plate is used, in conjunction with our soft armour incorporating the BTS, to protect against high velocity rifle, a reduction of up to 40% in the back face deformation can be achieved. 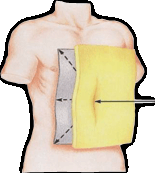 The patent protection applied to the Blunt Trauma Shield means that no other company may exploit the unique advantages of this system. The wide, padded, breathable soft mesh shoulder straps ensure comfort by reducing tension on the shoulders to insignificant levels. The Armourshield design of shoulder and waist straps ensures the proper fit to promote comfort and safety. Our body armour panels are designed and shaped for maximum ballistic protection and comfort. The panel profiles are optimized to prevent bunching and to provide a high level of mobility during movement. The unique BTS (Blunt Trauma Shield) system also prevents any bunching or panel drop. Our carrier slides easily against the uniform shirt, allowing your armour to keep its position against your body. Soft as silk, our new low-abrasion, snag resistant nylons are comfortable and lightweight manufactured from a mixture of breathable nylon and open mesh moisture transport materials. Armourshield can offer sonically welded envelopes to keep the ballistic materials enclosed dry and protect against humidity. No more worries about degradation due to exposure. Mildew and mold are eliminated preventing the formation of "body armour odor". The patented BTS protects the wearer from the effects of blunt trauma by absorbing energy and distributing impact forces over a much larger area. BTS protects vital organs and reduces blunt trauma by up to 35%. Our system allows for oversized trauma protection still allowing maximum comfort. All Armourshield vests are available with BTS as standard feature and are located between the ballistic materials and the wearers body. Best of all because of its paper like flexibility BTS is almost unnoticeable. "What other body armour can provide BTS over the whole of the ballistic panel - front and rear!"